I’ve volunteered to help at a 200-mile 40-exchange relay road race on March 1&2 (yes, it’s two days long from Saturday to Sunday). It is called the Texas Independence Relay and goes from Gonzales, TX to East Houston, TX. I will be the lead vehicle, which means I stay with the lead runner who ever it is, and phone ahead to the next exchange to tell them we’re coming. When I get to an exchange I need to drop off a packet of supplies with the volunteer there and help set up the exchange. So yesterday I drove the course with the race director, Jay H. We started at 6:30 AM from the house, and drove to Gonzales. At 8:10 AM we began our journey and drove to each and every exchange to East Houston and the San Jacinto monument. We finished at 4:25 PM – that’s 8 hours and 15 minutes and we didn’t stop much. During the trip I used the maps from the race. I also used a Garmin StreetPilot GPS that I had borrowed and downloaded a route which I entered earlier in the week. It was a lifesaver since it helped keep me on the route. After we were done I asked Jay if he knew how to get home and he said yes, so I turned off the GPS and we headed back home. This was fine until we got to Brenham and made a mistake because we were talking too much. It was only when we had gone miles and miles north and the road unexpectedly ended in a T-intersection that we realized we had made a mistake. OK, so I turned on the GPS and told it to plot a route to home. Neat. No problem. We were again driving along heading home albeit on a longer path toward the south. Again we were talking and I didn’t realize we had entered a small town until I looked in my rearview mirror and saw that we were being pulled over by a police car. Yup. I got a speeding ticket (my second in 40 years) in Thrall, TX for driving 60 in a 50-mph zone. Ouch. Oh, I now need to pay about $200. Double, Triple, and Quadruple Ouch. I finally got home about 8:30 PM. What an adventure. Let’s hope that next week is less eventful. Our running class met this Thursday for dinner. We ate at NXNW which is a microbrewery near to home. Two of my four running buddies were there. Celeste bought me a beer and Glenn told stories about going out too fast. It was fun to recount the experiences of running the marathon with many of them. Each person had a different adventure and fought their own battles. I looked at my time and compared it to the others. Even though I thought I was at the very back of the pack during the marathon, I now see that my time was about in the middle of all the people in my class. It still doesn’t change my mind about retiring from running the marathon though. 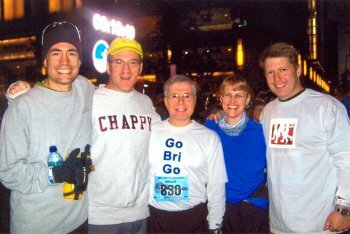 L to R: Glenn K., Jay N, me, Celeste D., and Chris L.
Tomorrow I run my sixth marathon, the AT&T Austin Marathon. I have no performance goals. No heart rate monitor. No pace band or calculator. All I want to do is complete it – run, walk, crawl – it doesn’t matter. Hopefully I’ll be running with friends – my running buddies from class: Celeste, Glenn, Chris, and/or Jay. They’ve helped me so much this year. Now I need to go to bed since I’ll be getting up at 4:30 AM to prepare for the 7:00 AM start. Wish me luck. I’ll need it since 26.2 miles is a long long way to go. P.S. To my sweetheart, Kathy, I love you. You make my life sing such a sweet duet together. I slowly ran four miles this morning. I have not run for four days. My class last Tuesday was terrible for me. We had to run seven miles. By this time that should be easy. However my right calf was unusually tight, and my left inside ankle had a burning sensation. It is the left ankle that worries me the most. I had to walk several times at class. This has me really concerned. The burning sensation didn’t go away after running for a while. Now today it is back again. So even though I rested it that has not helped. I am very worried since I didn’t run very fast this morning and the marathon is this weekend. All the more reason to stay at the back of the pack, walk when needed and just try to finish.